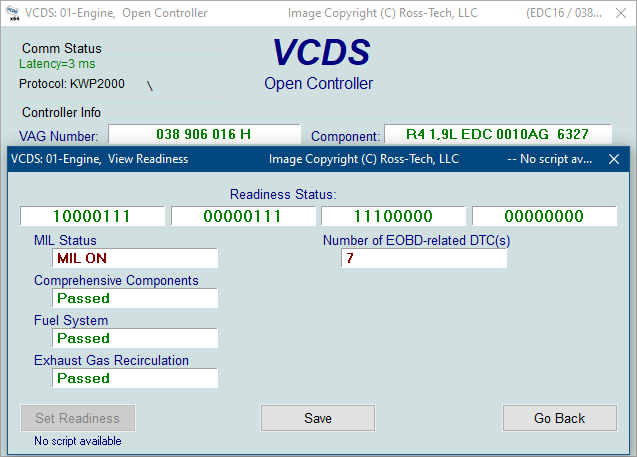 The Readiness Code is a set of 8 bits, each of which corresponds to one monitored emissions "system" in an OBD-II car. When all readiness bits show "Passed", it means that all systems have been checked and have passed the on-board tests. The Readiness screen shows the name of the script in the title bar and under the [Set Readiness] button, or gives a reason why [Set Readiness] is disabled when that is the case. Whenever you clear DTCs, all readiness bits that are testable will be set to "Fail" or "Failed or Incomplete". Most cars do not have all 8 systems, so the ECU should recognize the bits corresponding to systems that are not actually in the car. These will come up "Passed" automatically without going through any tests. It takes a variety of specific driving conditions to "test" all the systems. In practice, driving a properly-functioning car for 2-3 days including at least one short highway trip, should be sufficient to test each of the Readiness Bits to set all of the testable ones to "Pass". 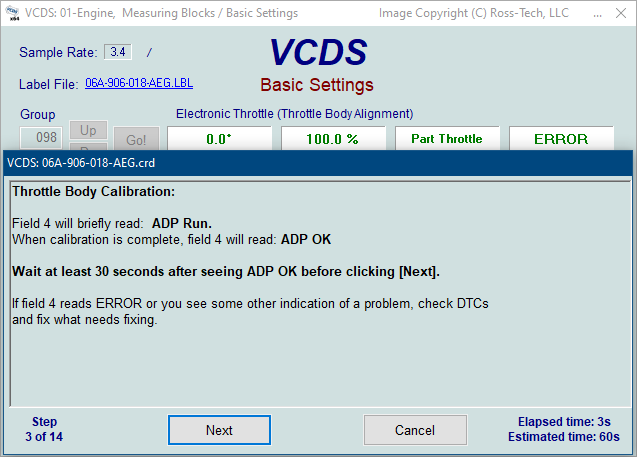 It can be done in a short time using a very specific and complicated procedure found in the On Board Diagnostic section of the Factory Repair Manual for your engine or you can use the Guided Readiness Script function in VCDS as described below. Use [Go Back] to return to the Controller Information Screen. Use [Next] to advance through the on-screen prompts or [Cancel] to exit out of Guided Readiness. The Guided Readiness Scripts require supporting data in Label files. Not every possible engine is currently documented but we hope to have most US-model engines covered in the near future. If you have a specific engine you would like to see covered and have a written procedure for it, please contact us, preferably by emailing an AutoScan.. The Readiness function is only available on Engine Controllers that are OBD-II compliant (all 1996 and newer US-Model) or EOBD compliant (all 2001 and newer European-market models). Non-US models and older TDIs may not support the Readiness function even though they are otherwise OBD-II compliant. OBD-I did not require any Readiness "monitors". 12V 2.8L V6 engines may have readiness bits stored in or near Measuring Block Group 029. 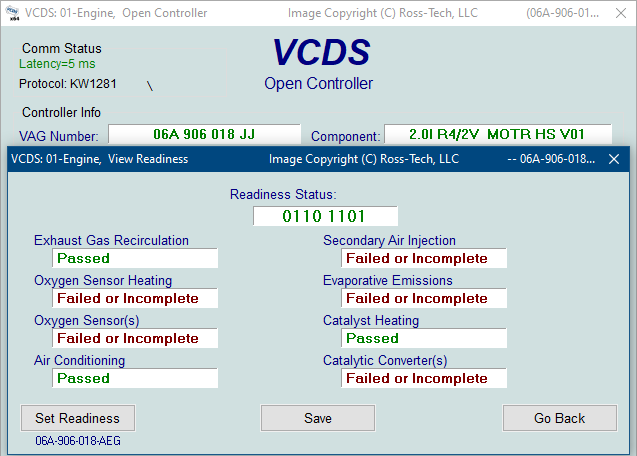 You can check Readiness status in the Generic OBD-2 section which may show results that are more comparable to what State emissions testing machines show. Many engines that use CAN will have a choice in Basic Settings like B200 Readiness Code (Automatic "End of Line" Check). In these engines after initiating Basic Settings, the operator holds a foot on the brake pedal and floors the accelerator pedal, while the engine controller holds different RPM points and runs through all of the tests. Many engines that use UDS will have a choice in Basic Settings like IDE00553 Automatic test sequence. In these engines after initiating Basic Settings, the operator holds a foot on the brake pedal and floors the accelerator pedal, while the engine controller holds different RPM points and runs through all of the tests. While in Basic Settings, the Show Measuring Data button be used to display "IDE00727 Test steps still to be performed" or similar to watch the remaining steps count down to zero.